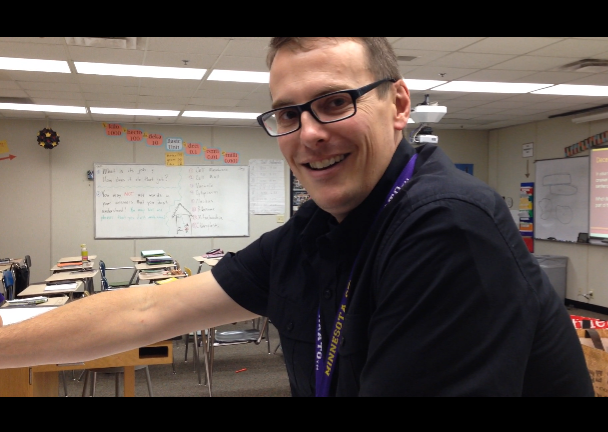 Science teachers have been experimenting this year with new techniques to engage student learners. These strategies put students at the center, observing, documenting, and questioning, throughout the learning experience. 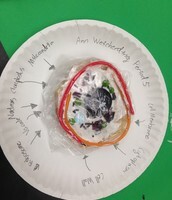 Students prepared their lab stations with food products that represented cell parts such as a vacuole, ribosome, cytoplasm, mitochondria, cell wall, nucleus etc. 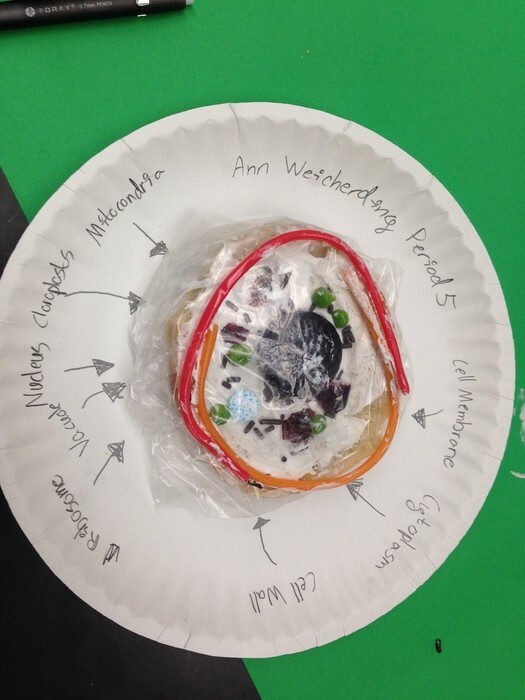 7th grade scientists Alex and Ann create cell models. Prior to the lab, students investigated cell parts, determined the job of each cell part, and identified how each did its job. 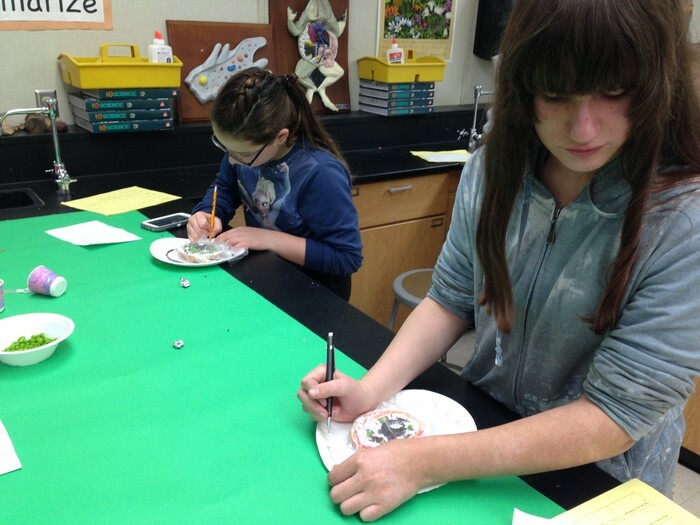 This activity wrapped up with a four-paragraph essay where students compared and contrasted plant and animal cells. They accomplished this task after first making observations about two cookies and completing a Venn Diagram, setting the foundation for their compare/contrast essay. Good enough to eat! Students checked in with Mr. Shores to determine if their models were correct. Thank you Tandem Bagels for your donations! 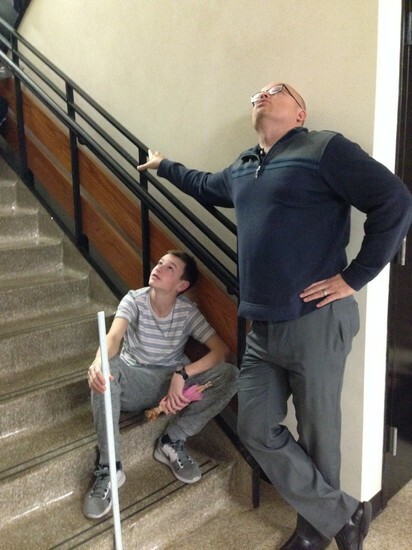 Mr. Davis supervises as 8th grade Algebra I student Jay patiently awaits the next Barbie doll to drop. In the real world, it is sometimes necessary to develop a mathematical model to predict how something will perform. Students developed an equation to describe the amount of stretch in a bungee cord of rubber bands of varying length. The thrill of the bungee jumping experiment is to see how close the jumper (Barbie) comes to the ground without actually hitting it. 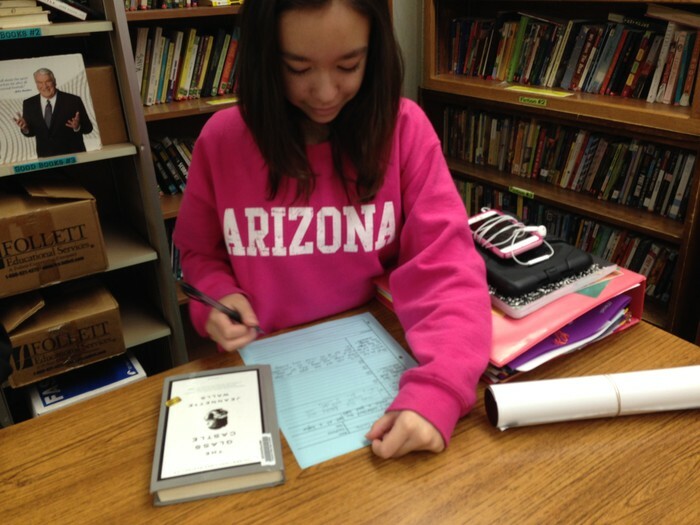 Maile works independently on her family novel notes. 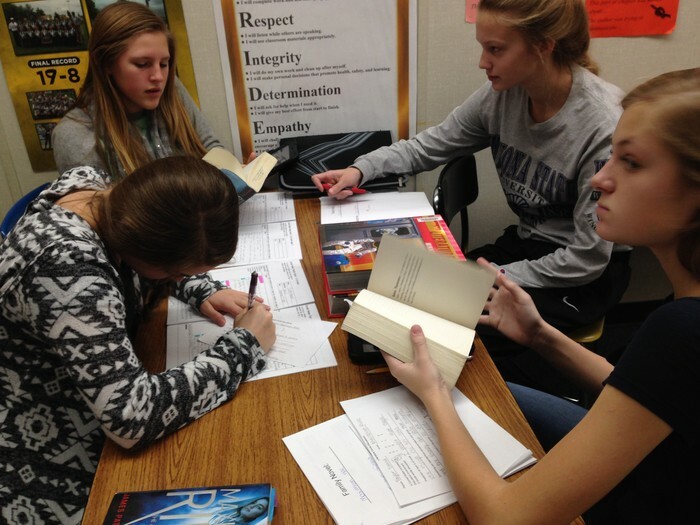 8th grade English students selected novels of interest with a family theme second quarter. They interacted with the text by completing Cornell notes as they read in preparation for future literature circles. Destiny, Jessica, and Maleeka practice the critical reading skills of marking the text, writing in the margins, and summarizing. Students grab hold of their learning as they participate in literature circles to strengthen their understanding of their family novels. They worked on identifying main ideas and asking higher level thinking questions to deepen their discussion. We've found our future book club members! 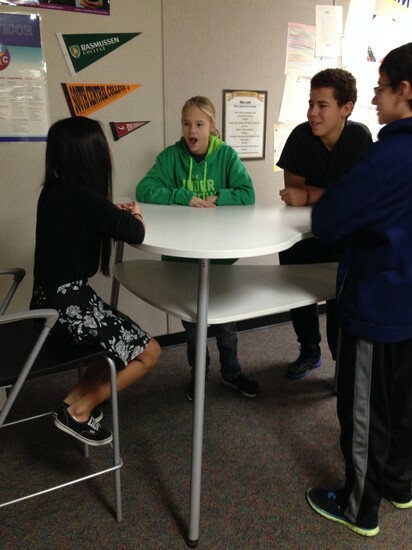 Students test out a potential tall puzzle table. A committee of teachers and administrators have been meeting monthly since August to determine the best options for furniture for Prairie Winds Middle School opening in the fall 2016. 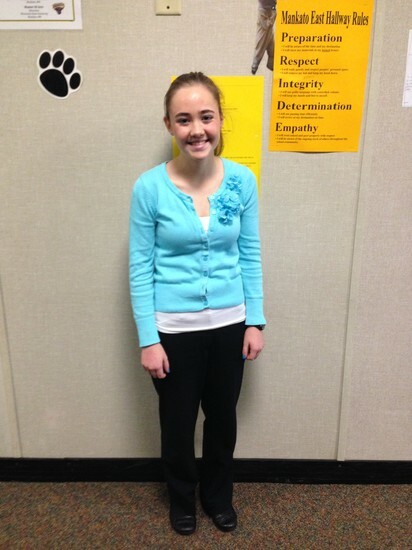 8th grader Madeline qualified and competed at the MN State Debate tournament. 8th grader Malachy (not pictured) also participated at the tournament. 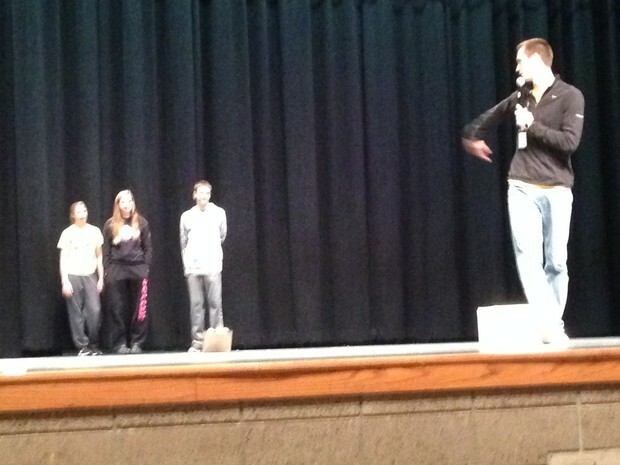 Great job representing Mankato East Jr. High. Students circle up on Mondays and Thursdays during CPRs to build an advisory of trust and to get to know each other better. 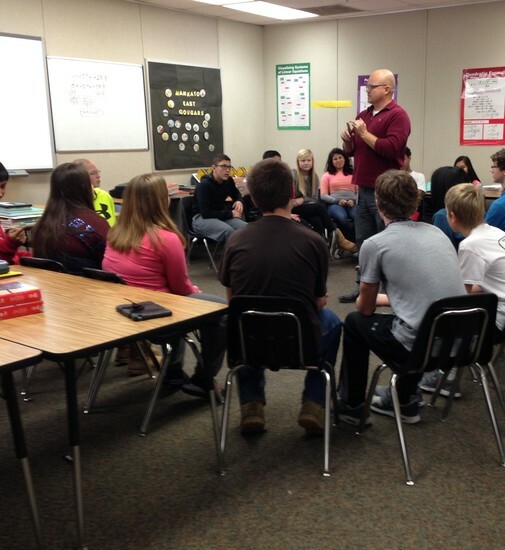 The students pictured here were prepping for an activity called "When the cold wind blows." 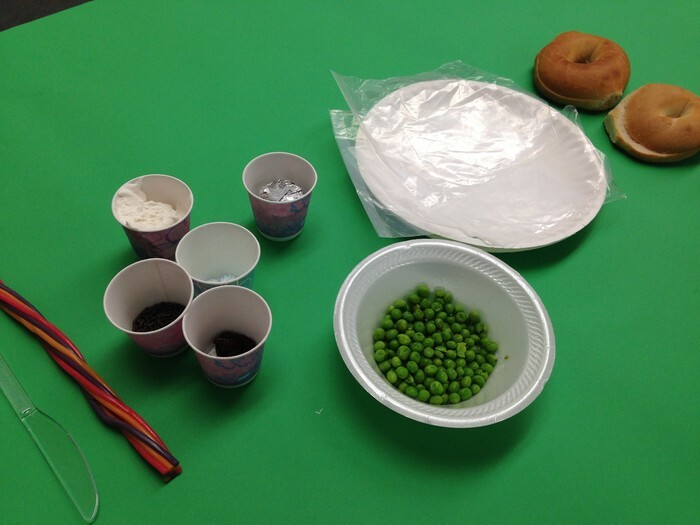 This activity required moving across the circle based upon reflections of past experiences and personal preferences. 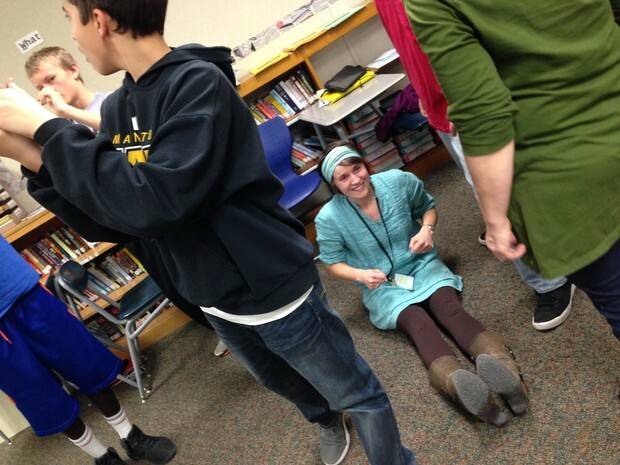 Advisories also took part in a MLK, Jr. Day CPR on January 18 with a focus on Dr. King's philosophy of nonviolence and what we can learn from his ideas. 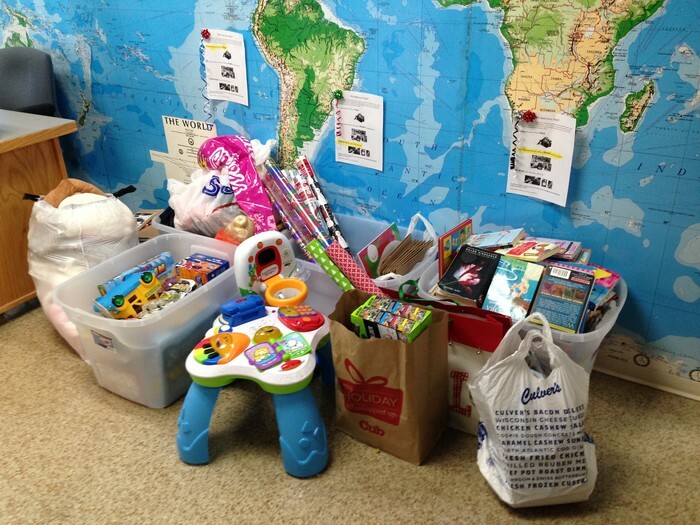 Mankato East Jr. High students and staff donated gently used toys and children's books, as well as holiday gift wrap, for a recent local act of charity. 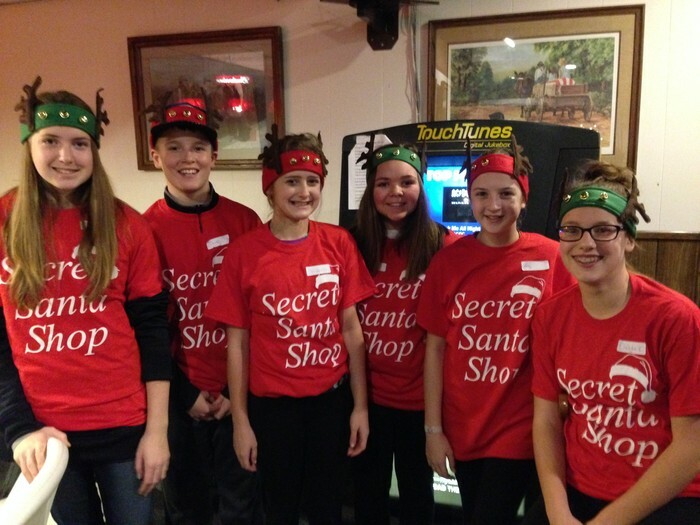 Donations benefited the Secret Santa Shop that took place in Eagle Lake on Dec. 13, 2015. 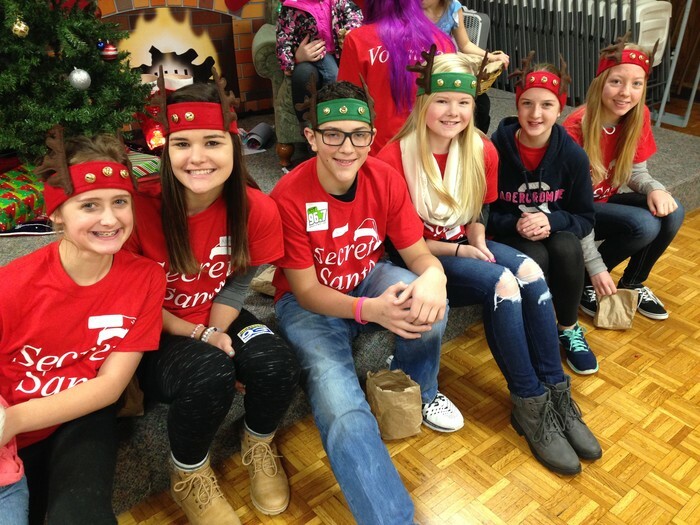 Several Student Council members volunteered their service at the event. Their primary responsibilities were to entertain, supervise, read to, and play with children while parents shopped for presents. 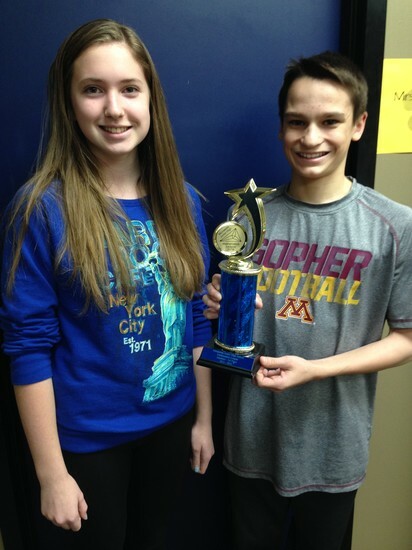 Math League - Team Champions! 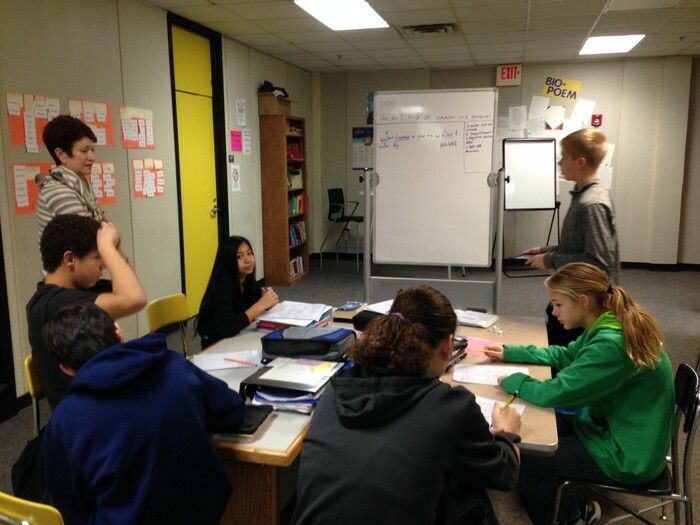 The EJH Math League team went 5-0 in competition this season against New Ulm, Lake Crystal, and DMMS. Pictured below are Parker (2nd place) and Katelyn (1st Place) East's individual champions. Great team effort kicking brain and keeping the winning streak alive! This makes 21 championships in 22 years! 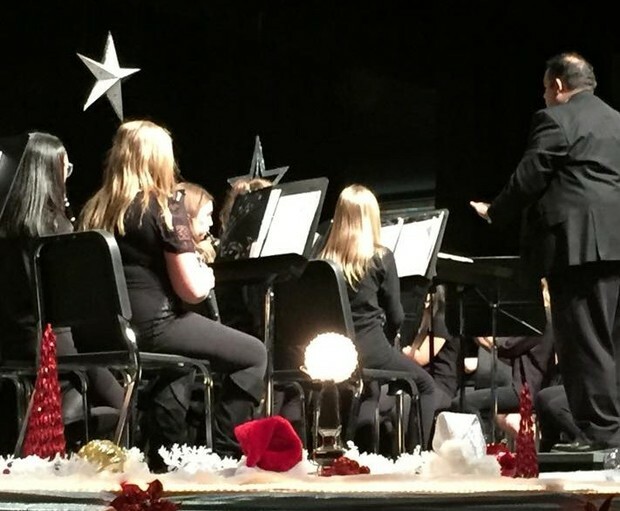 The 8th grade band performs during a holiday concert under the direction of Mr. Eichhorst. Student Council members Zoie and Emily hit the hallways promoting a fundraising event to support our Climb 2 Feed Kids staff team the "Mankato East Junior Hunger Crushers." 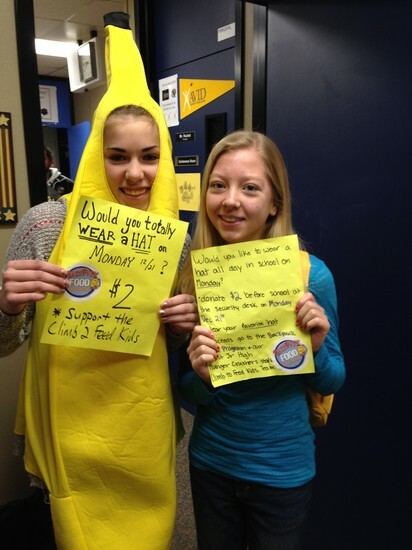 Students who donated $2 could wear a hat all day in class. Teachers who donated $5 could wear jeans. Together we raised $244 toward our goal of $1000 before competition day at MSU. All proceeds benefit the Back Pack Food Program. 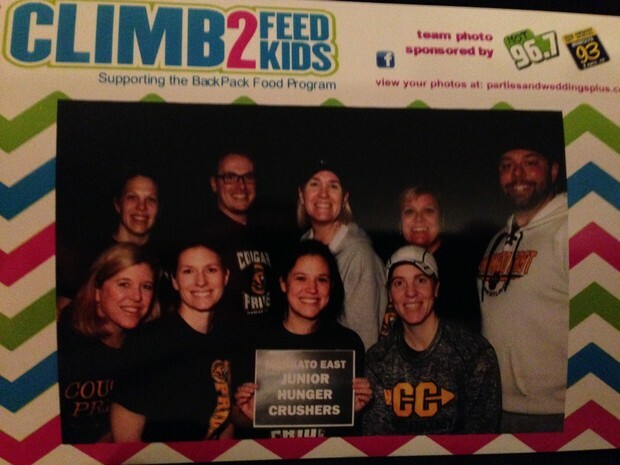 The teamed raised $1150 overall and had a great time climbing steps! 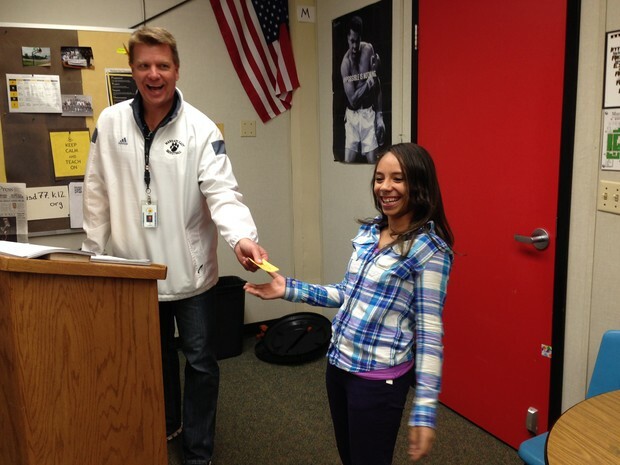 8th grade English student Diamond receives a HIGH PAW recognition in class for demonstrating her P.R.I.D.E expectations and for being a model East Jr. High student. Students enter their High Paws in a drawing and can earn opportunities to take part in quarterly Minute-to-Win-it challenges during PRIDE assemblies and/or win prizes. 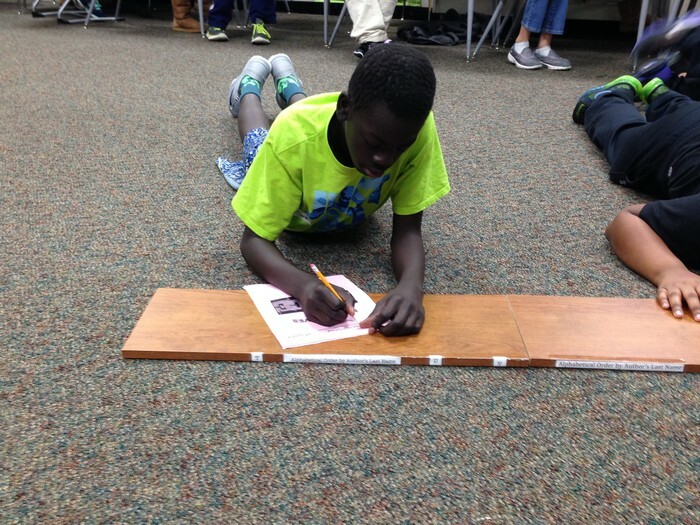 7th grade student Charan grabs a writing surface and takes a seat on the floor to begin working on his perspectives on piece assignment. Tufah freezes during an acting lesson. 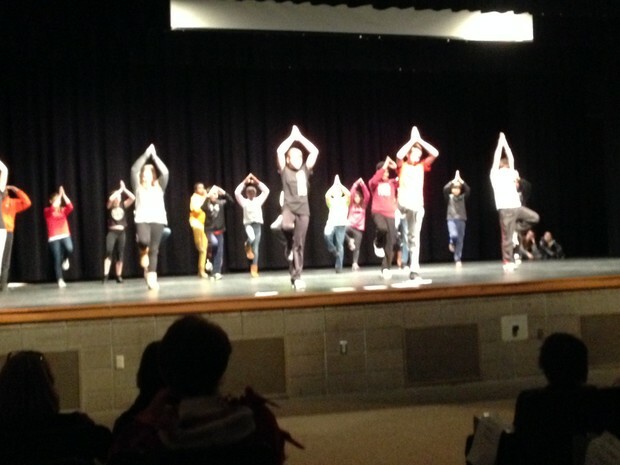 Students spent 10 days learning the tricks of the trade for performing on stage. 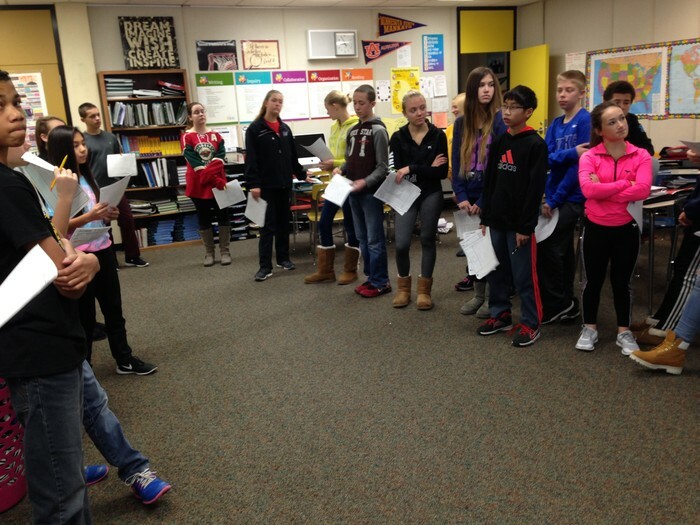 7th grade English students Tristan, Medy, Emma, Nick, & Hailey practice a routine in preparation for the Stages Theater Perspectives on Peace performance. 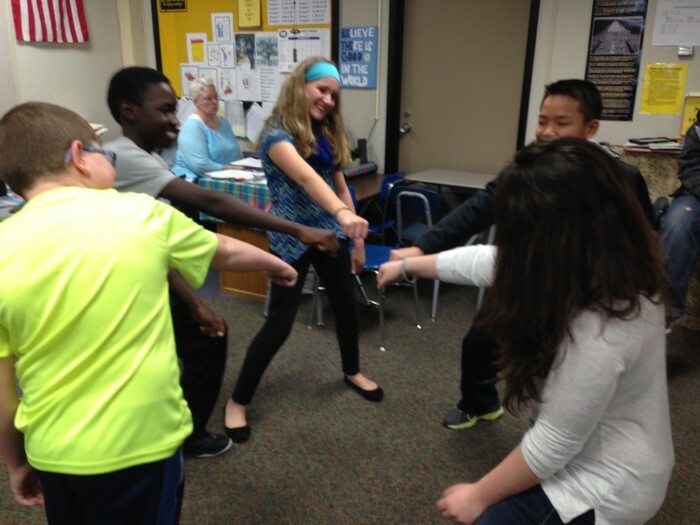 Students acted out stories using various sequenced poses. 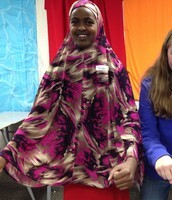 The Perspectives on Peace Performances took place during English 7 class periods. Reflection occurred after each performance involving audience interaction with students, parents, teachers, and Stages staff. 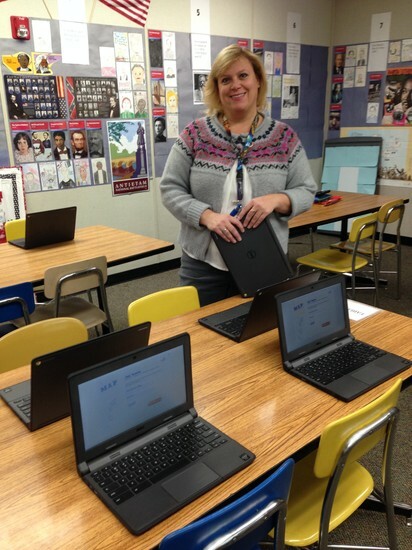 Taking advantage of our new Chromebooks, social studies and math teachers proctored the winter NWEA reading and math tests in their classrooms. This process has traditionally been done in a computer lab. Teachers will use the results of this formative assessment to guide their instruction and best meet the needs of their students in preparation for upcoming MCAs. 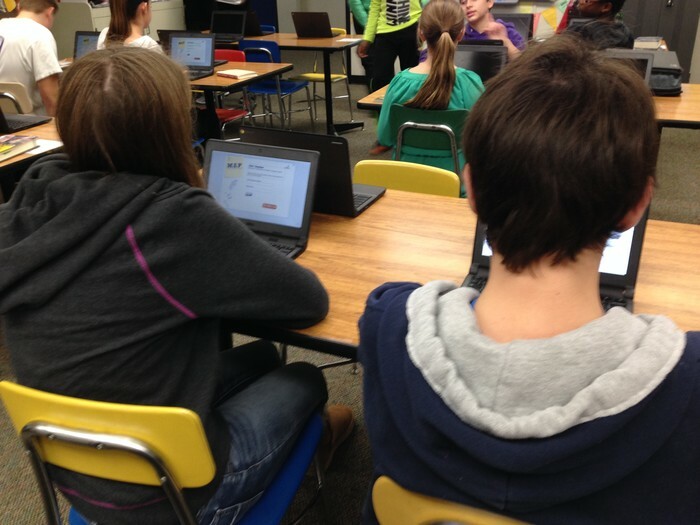 Students in Ms. Tibben's 7th grade US Studies class take the reading NWEA test in the classroom. 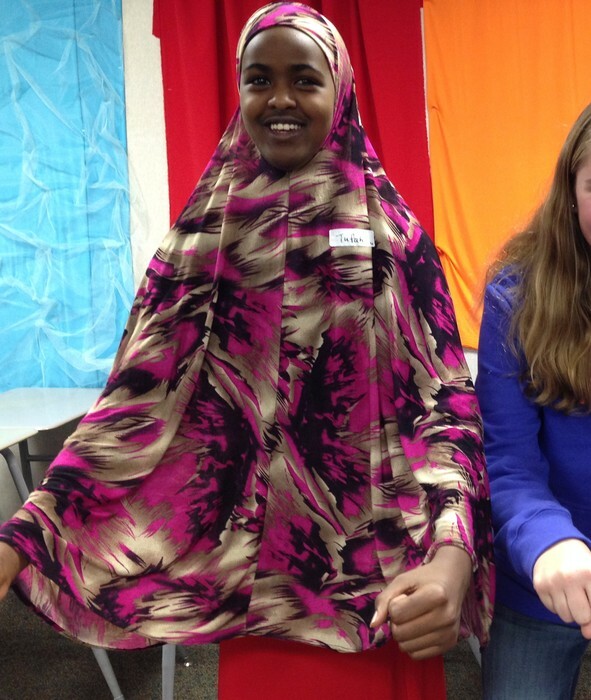 Round one of the National Geographic Bee took place via the iPads in Advisory on Wednesday, Jan. 20. The top 10 students in the junior high will advance to Round 2 that will take place in the auditorium in the coming weeks. 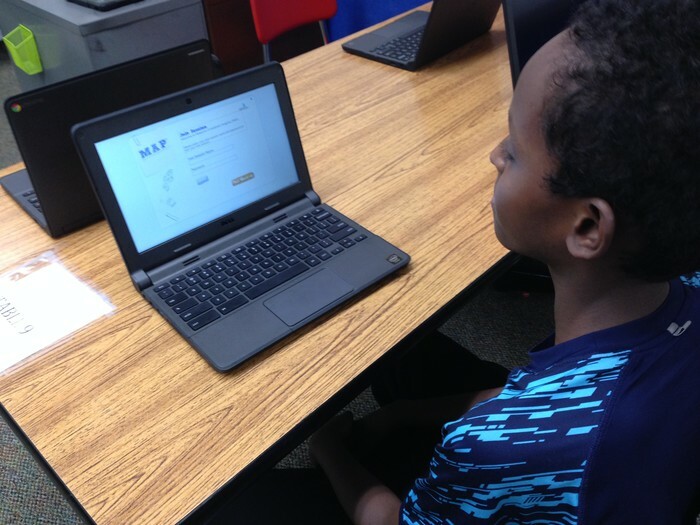 7th grade student Abdikafar reads the NWEA testing screen before he begins his reading test. 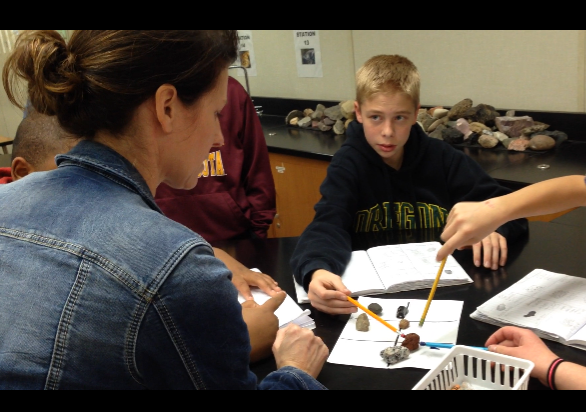 Austin confers with his teacher to clarify whether or not he correctly identified the rocks. 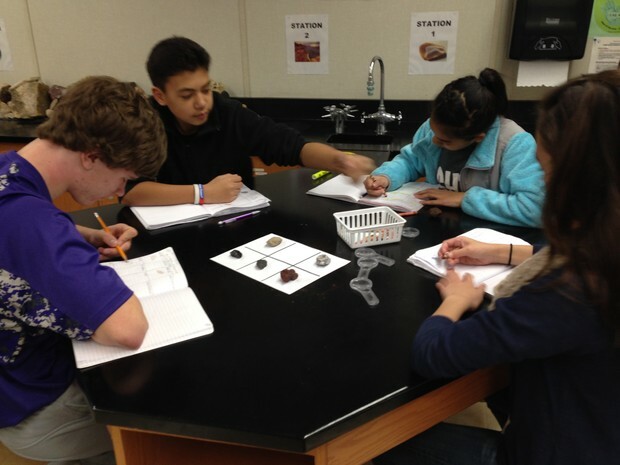 Earth Science students Gavin, Jackson, Mckayla, & Maile make observations of mystery rocks and drawings in their Interactive notebooks. They continually rotated their notebooks around the lab table noting similarities and differences in their classmates ideas. Engagement reached a new level as their notebooks became public record of their work. 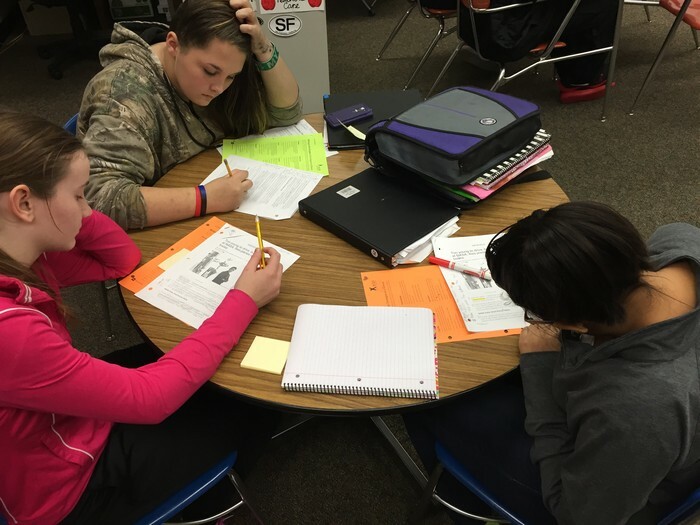 8th grade students argue from evidence found in their reading about the central statement, "All Students should get a job while in high school." Throughout this structured debate format, students were challenged to paraphrase the previous student's comments and then ask their question to the group. 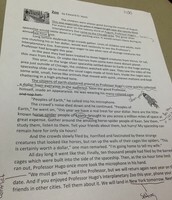 7th grade English students mark the text and connect with their own ideas by writing in the margins as they identify story elements. Community member, Linda Johnson, helps facilitate the AVID tutorial process during class. AVID tutors are in high demand and short supply. 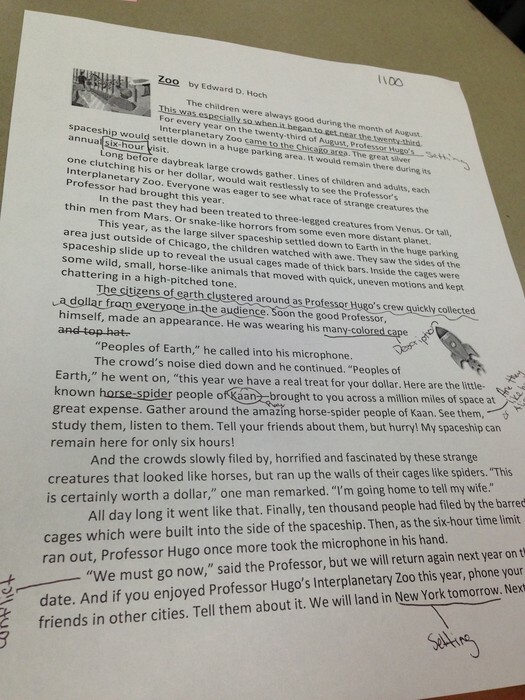 Tutorials stress the importance of thinking critically and require students to generate questions that will guide students toward figuring out their Point of Confusion. Looking to the future, which college will you attend? How will you choose that college? What information do you need to make a good, informed choice for yourself? Advisory members developed and answered questions about their advisory’s selected college. 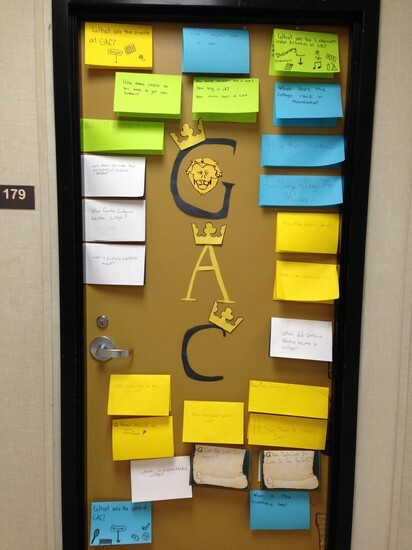 The research was then displayed on their door. Come stroll through the halls and see the numerous colleges and wealth of information! THANK YOU TO THE ENTIRE EAST JR. HIGH SCHOOL COMMUNITY FOR YOUR HARD WORK AND DEDICATION TO STUDENT ACHIEVEMENT!! !